I have to admit I am a small town girl at heart. I know this because as soon as I am in any small town I get the warm fuzzies and want to move there. For me there is a mystic to small towns, I want to get to know the people; for some reason people seem more individualistic in a small town; not as concerned with “fitting in”. I want to know why they are here, what’s their story? There is an “innocence” about a small town and I find them romantic and intriguing. I also love to explore all the little shops and local points of interest. The latest project my brother has been working on is in a small town about 45 minutes from Whistler and an hour out of Vancouver. I think everyone in the world has heard of Whistler, the winter Olympics were held there a few years back. As I was driving through the heart of Vancouver I couldn’t help but appreciate the beauty of the city and its vibrance but I wouldn’t want to live there. 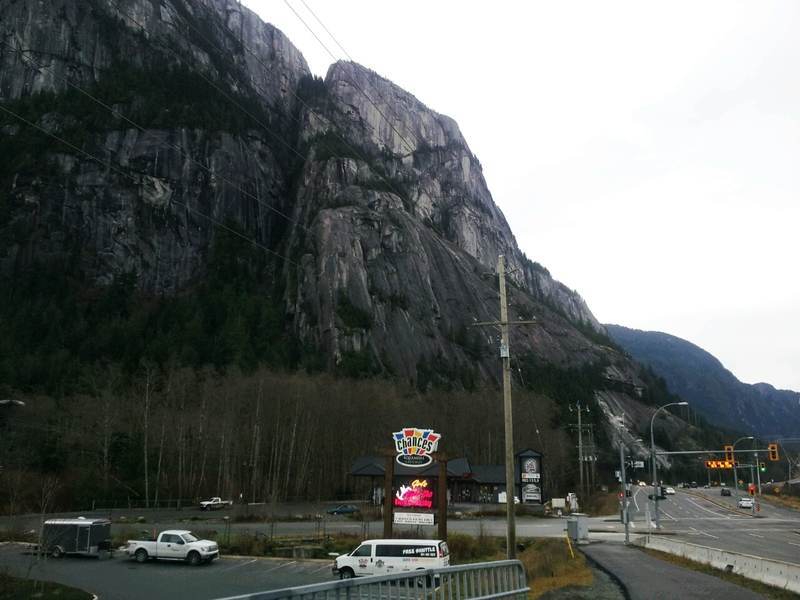 quamish, on the other hand has always appealed to me. JC worked for a few months as a mechanic for one of the road crews pre-olympics. He was in a hotel in Squamish and I spent a fair amount of time there with him. Let me clarify that, he found many excuses for me to come to Squamish but once I was there I was alone. The whole time he worked there he made phenominal money, we were less than an hour from Whistler and “we” didn’t see any of the area. I did my siteseeing alone. Yet I still fell in love with the town and was prepared to move there but I was hauling scrap at the time and it was quite a bit of a distance from the scrap yard plus at that time I didn’t have the confidence to just up and move that far away from my comfort zone. 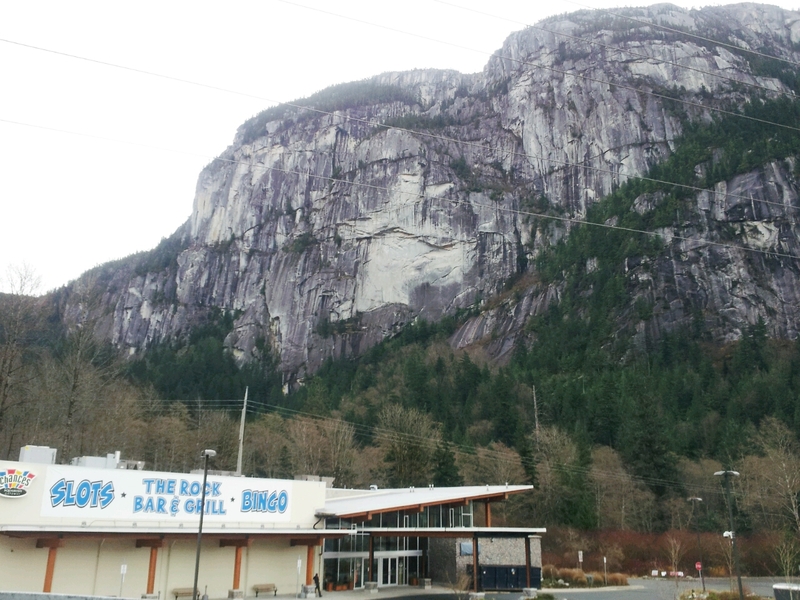 The road to Squamish is called the Sea to Sky for very good reason; I know of no other place that is right on the ocean yet nestled in the mountains. On any given day you could quite feasibly sail on the ocean, go to an art show and 1st class lunch in Vancouver AND then go rock climbing, catch a few runs up at Whistler on fresh powder and finish the day with fine dining by a roaring fire in a ski lodge. If you are really speedy you could attend a real native power wow (Squamish is a native word), get some fishing in and if you’re lucky see a few bear and deer. The push is on to finish the job so my brother got me a hotel room for the week and I am up here with the crew. I do whatever they need me to do, clean up, run to get stuff; today I was supposed to be doing office admin stuff but the bar has to open tomorrow and they need me working to get the job done. I brought two pork tenderlions with me that I had started the day before in the slow cooker for pulled pork sandwiches and served that for lunch with coleslaw, chips and I bought a big cake. Not a morsel was left. Aside from making lunch I applied bees wax to probably 3 dozen butcher block table tops, vacummed as my son and his buddy Zac were routering. (Its really a unique experience being here working for my brother, alongside my son and Zac is my son’s best buddy since they were toddlers. I told them I have dirt on all of them and they have all warned me not to embarrass them . Haha I should make them pay for my silence lol. My poor kid has been working 16 hour days for a straight 20 days and is sick with the flu on top of it all but he’s determined to get the job done. So very proud of him, his talent is obvious, and there is no doubt without him the job would not have gotten done on time. But back to small towns. I arrived about dinner time yesterday after stopping for supplies several times on my way up. I worked until about 9 and then met the crew at the pub under the hotel. It was a small little bare bones kinda pub and the only people in it were from our crew. About 10:30 the girl who works the desk at the hotel came into the pub looking for me because she gets off at 11:00 and then I would be hooped for my room key. You see, at 11 the hotel locks up and doesn’t reopen until 9 the next morning. In order to get in you have to have the pass code to enter the building. They leave an emergency contact number at the front desk and you are on your own. The rooms are spotless and recently repainted. All laminate floors, nice linens, all have a tv and ipod docking stations but no phones in the rooms. Plus each room has a microwave, fridge and coffee maker. All for $50 a night and they have free washers and dryers for use between 4-11 because the cleaning lady uses them during the day. I slept like a baby and only woke up because I heard doors opening and closing. It was 7:15. The crew was starting work at 7. I got ready and was out the door by. Not a soul was outside. There was not a sound, no cars on the roads, it was sublime. Now I am going to track my brother down and get to work but just wanted to share some photos of this little gem of a town. 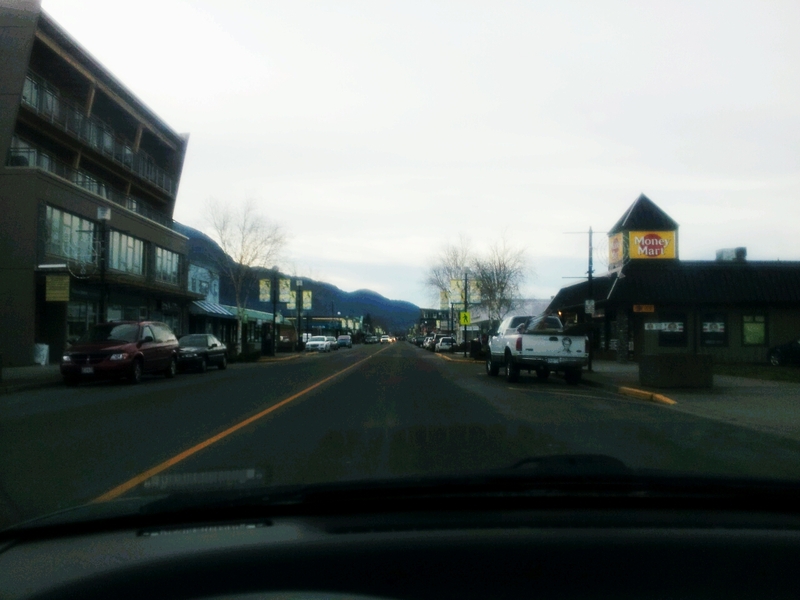 Downtown consists of one road. 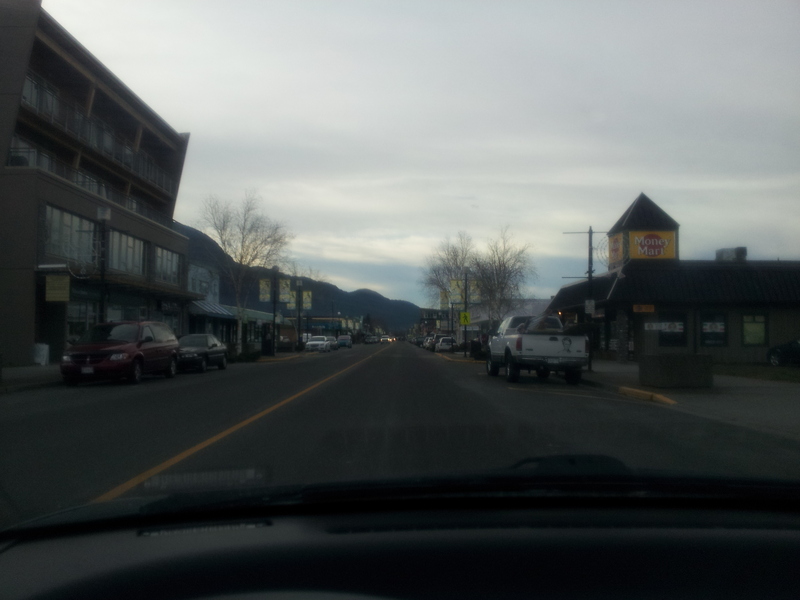 Squamish has one main street and this is it. I get that way too when it comes to small towns. It’s like; “I wonder what this place is like to live in?”. I guess it is just one of those odd curiosities. What you write, express, etc…. It touches on so much that initially feels a bit overwhelming to read, take in. Actually painful also to read at times. What was sensed, it was not my imagination. Loss included alienation between parent and child(ren) three years into the divorce when they were teen-age. Them told things that never occurred, their upset enabled rather then support of other parent, etc., all unfolded to alienation occurring. Rare to read on topic you write about. It’s a topic that’s based on experience(s) that have elements of vagueness, shell game, etc. These experiences that occur, those who have not experienced this don’t understand and at times not understood myself, until I did begin to “wake up” and see. Yet reading your blog, it puts words, clarity to what strongly sensed but could not put words to. No “fault / blame / them more then us” / etc. Simply understanding as it contributes to release, clarity, ease in the heart, soul. Upsetting experiences but won’t also allow core of soul and heart also be lost. If I did “give in” to that, then that would be additional “loss” in all this. Upsetting? Feels heartbreaking? Want to just kick in the shin! Yes!!! Yet also growing in who I’m being in the face of events that occur. To even have this place to read your blog and have this space to leave comment on event(s) not commonly experienced and/or known by people…Nice to find your blog that puts words to this experience. Leaving this here expressing a thank you for the words you share for others to read. By the way, the grumpy face icon that shows up next to my comments, It’s an icon that was already there. Grumpy face not me or my choice. Upsetting things happen, took me awhile but have learned to smile again.